This morning was cool and crisp, sunny with a few puffy clouds. Gorgeous! Perfect fall weather. 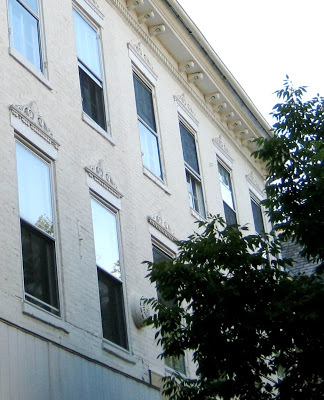 It was my kids’ first day at preschool, and I am renting a space nearby for a studio so I don’t have to drive home between drop-off and pick-up. !!! As other parents were taking pictures and hiding tears I made a quick exit and couldn’t wipe the smile off my face. I walked by the coffee shops to say hi to other preschool moms. (There will be plenty of time for good coffee; I was already wired.) I walked to Simply Charming Boutique to check on my Sedona collection and show them some new graduated turquoise strands I bought. (They are my middle-man, so they know the customers and I don’t. I like getting a read on things when I can.) I love being downtown! Finally I unloaded a box of stuff at my studio, only to realize I forgot to pack my pliers which is like forgetting my hands. 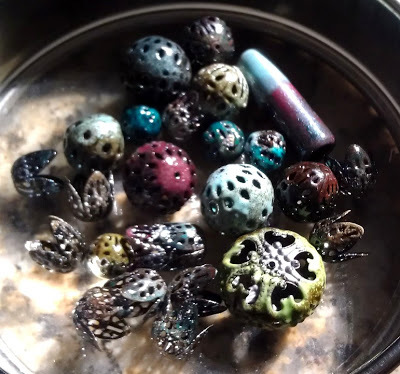 I had been a little disappointed at the thought of being cooped up inside on a day like this anyway, so I drove home and enameled beads with my torch. For the enamel nerds: I’m testing colors from my sample pack from Rio of Milton Bridge transparents, and I really like that Ruby transparent bead toward the center. And over to the right there’s Autumn Brown. And several of the others have Autumn Brown layered over something bright (Turquoise, Nile Green from Thompson, etc.) Some of the deeper green-blues have Mallard Green in them, another MB I like. We didn’t have much cool weather over the summer (my bench is in the garage) so it was nice to have a chance to experiment with color layering and bead-gripping techniques. Torch-fired enameling is tricky for me because I don’t want the bead to rotate on the mandrel, but I do want to get it off easily when I’m finished. And now I can work on that because it’s the most wonderful time of the year. I have learned lots of techniques within the scope of jewelrymaking: wirework, soldering, polymer clay, beading, resin, lampwork, PMC, the list goes on. There are certain things that just don’t interest me at all, and one of those has been enamel. Powdered glass melted onto the surface of metal, usually in a kiln. I skipped the Thompson Enamel booth at the last PMC Guild Conference. Call me a purist, but I like the neutrality (goes with everything) and polishability (is that a word) of silver by itself. I could bring color into a piece with beads, plus I didn’t care for the garishly bright enameled pieces I had seen. But last year Barbara Lewis published this book about torch-firing enamel, and she asked different jewelry bloggers to write what they really thought about the book and technique. We saw torch-enameled beads popping up all over the jewelry web, and many of them used a filigree base lightly coated with beautiful glass. My interest was piqued by Jen Judd’s necklace at the artBLISS* Meet & Greet. 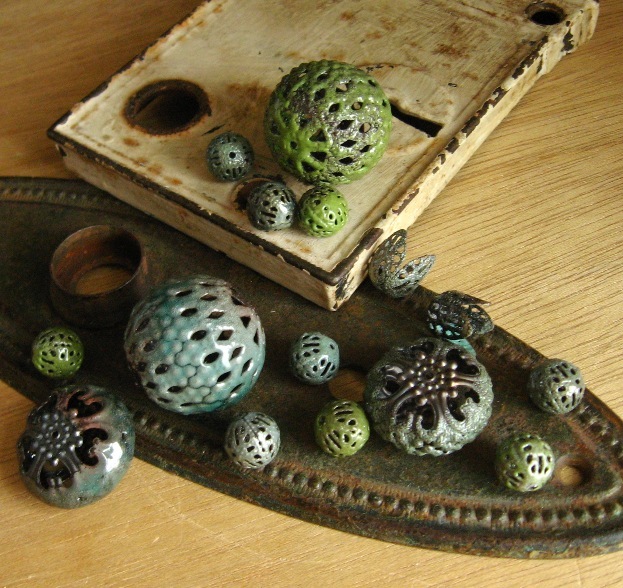 Beautiful enameled filigree beads in blues and greens. I had a tough time making eye contact instead of staring at the necklace. So I bought a torch-fired enamel kit. After all, I already have (most of) a lampwork station and it works for both. That was December. 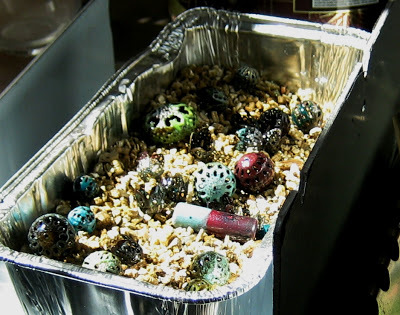 Today it is the second week of March and we’re having 80-degree weather, so during naptime I decided to try torch enameling out in the garage with my “big” butane torch, the one that melts silver way too fast. I figured I’d see if I liked it before spending my free time trying to get my propane tank and lampwork torch to talk to each other. I skimmed the tutorial, lit my torch, unscrewed the cap on an enamel jar, jabbed a few beads, and went at it. I know you’re not supposed to use enamel straight from the jar. You are also not supposed to eat peanut butter straight from the jar. Don’t tell, ok? So anyway, aside from having to refill my butane I just kept heating and dunking beads. It was so fun and easy! And no kiln annealing like with lampwork; you can use your beads as soon as they’re cool. I only burnt myself twice. Ahem. Here is what I made today. Now a Thompson Enamel booth would be like a candy store! 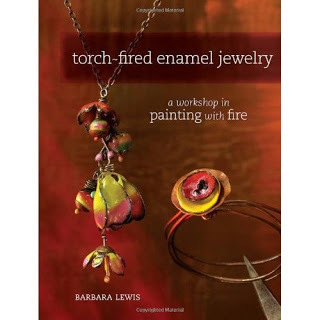 Good thing I can mail-order from Barbara (Painting With Fire Artwear). If you’re interested in learning how to do this technique, check out Barbara’s blog with links to everything you need.